BOMBSHELL! FELDA LOST RM4.5 BILLION 2013-2016! 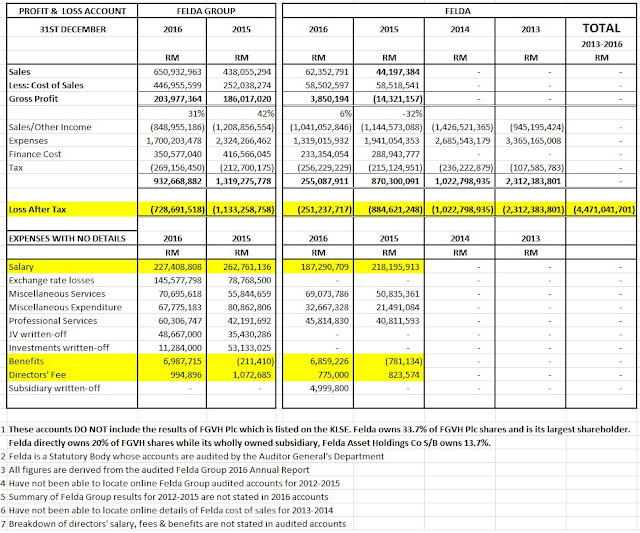 HOW MUCH DID FELDA GROUP LOSE? MORE LOSSES EXPECTED 2017! 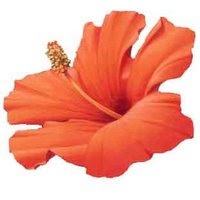 Please be clear that these accounts showing Felda's losses of RM4.5 billion relate to Felda and those of Felda Group, which own 33.7% of Felda Global Ventures Holdings Plc (FGVH) listed on the Kuala Lumpur Stock Exchange. These accounts do not include the P&L or Balance Sheet figures of FGVH Plc. Felda directly owns 20% of FGVH share capital while the balance of 13.7% is held by Felda Asset Holdings Co S/B, a wholly owned subsidiary of Felda. Felda Group is therefore the single largest shareholder of FGVH. 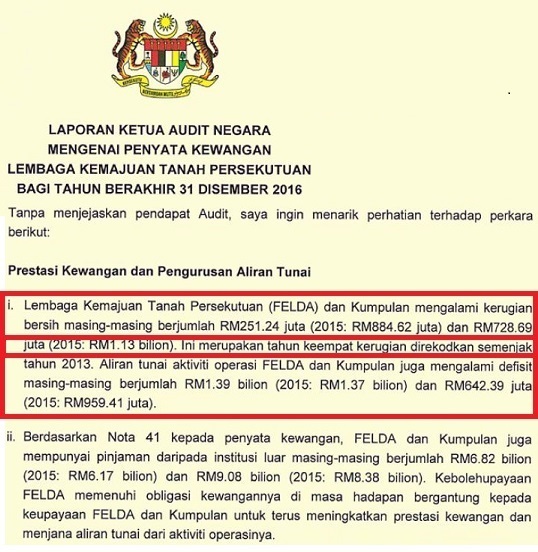 Felda accounts are statutorily audited by the Auditor General's Department (AG). For the full audited accounts CLICK HERE. Felda lost close to RM4.5 billion between 2013-2016. However, the corresponding figures for the Group are nowhere to be found in the report. We can however assume that the Group losses are bound to be higher, probably about RM5 billion. 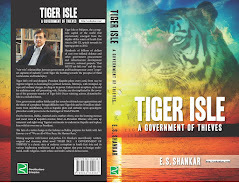 When Najib, who has taken on Felda as his pet project, suddenly announced the appointment of Shahrir Samad in January 2017 to replace Isa Samad as Felda Chairman, he did not outline the real disaster that had taken place at Felda. 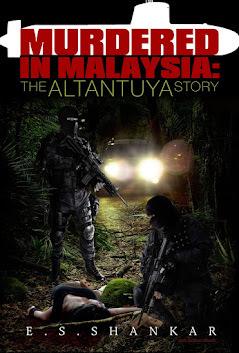 It of course reflects badly on Najib as a pathetic PM, as all top appointments to Felda and FGVH were made by him, and he has, through sheer incompetency and negligence, allowed the rot to set in at many a GLC. The situation has taken a turn for the worse with MACC investigations having commenced over fraud allegations regarding Felda's overseas and local hotel acquisitions, Jalan Semarak land in KL and other investments. The detailed P&L shows that Felda's profits have also been dragged down by some RM12 million losses posted in 2015 & 2016 by its hotel division. 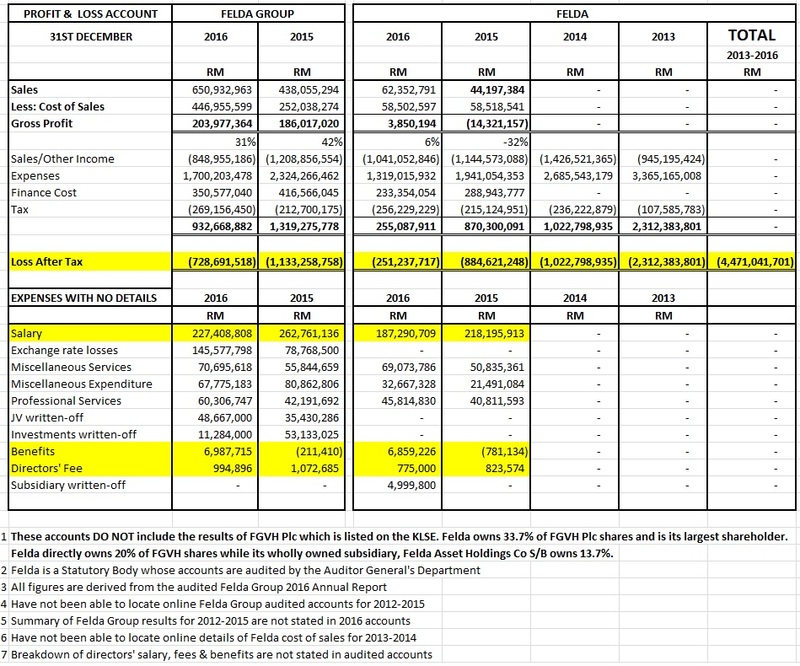 Also, the 2015 Gross Loss of $14 million at Felda is a shocker! Shahrir's stated focus on selling assets like Maybank shares suggests he is clueless how to restore core business profitability. 1. Investment in FGVH of RM4.7 billion whose market value is worth less than half its cost as the share price has tanked from its 2012 $4.55 IPO price to about RM2 currently, and as low as RM1.50. 2. FHVH RM1.69 billion in loans. 4. Pretty stagnant palm oil prices plus threats of a EU ban. 5. Total bank loans and borrowings of RM9 billion, which will balloon further in 2017 due to the disastrous Eagle High Plantations, Indonesia (EHP) acquisition of RM2.26 billion, financed by a bank loan guaranteed by MoF! Felda Group will likely see worse losses in 2017, given also its RM2.26 billion Investment in EHP which is now only worth RM620 million, a staggering write-down of RM1.64 billion in less than a year, and suspected to be a Najib fraud. Refer my earlier blog post. CLICK HERE. The crux of Felda's problem is of course that of a half-past six prime minister with half-past six business acumen calling the shots, aided by political Chairmen appointees with even less business or relevant management expertise. I have said it before and I will say it again. Najib has the touch of the plague and the kiss of death about him. Everything he touches turns to dust and destruction. 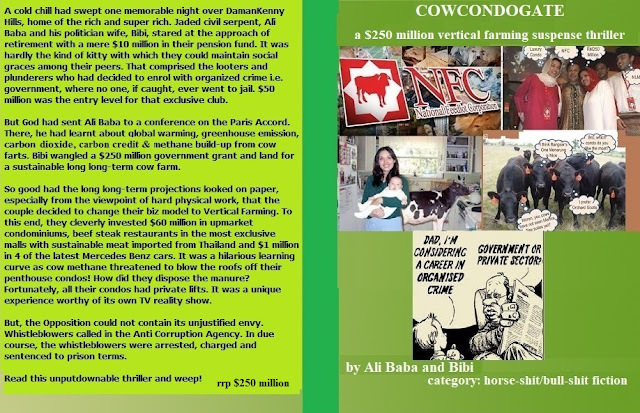 When will UMNO/BN and the Malays learn not to allow mediocrity, incompetency and fraud to flourish? MALAYSIA NEW NATIONAL LITERARY AWARD NOMINATIONS ANNOUNCED! 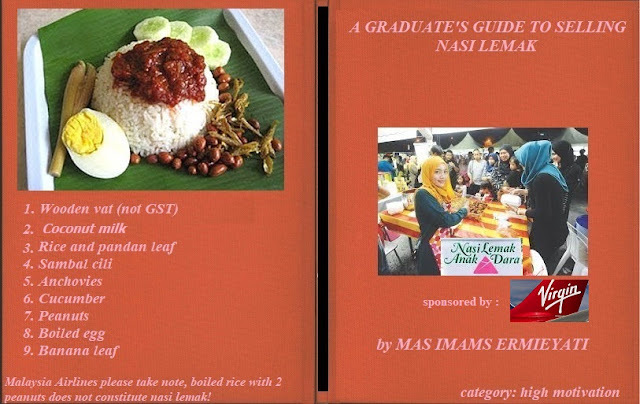 In an apparent effort to counter the perceived threat posed to "national unity" by the hugely popular and internationally renown George Town Literary Festival, Penang, prime minister Najib Razak aka Ajip Kor aka Appa s/o Bugisamy ordered the Ministry of Culture, Arts & Tourism to inaugurate the new Malaysia National Literary Awards. 3. 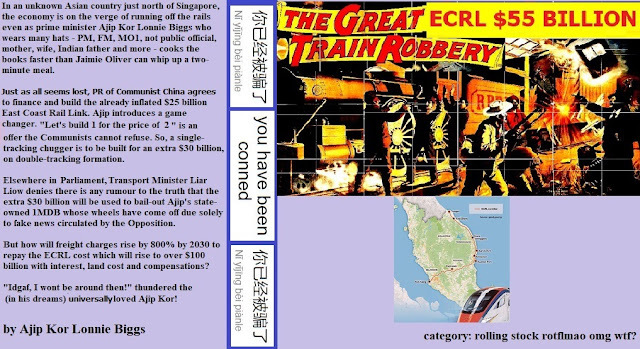 The Great ECRL $55 Billion Train Robbery by Ajib Kor Lonnie Biggs. Category: Rolling Stock ROTFLMAO OMG WTF! All prize winners will be notified after the general elections. BREAKING GE 14 NEWS! NAJIB TO RETURN RM2.6 BILLION! Prime Minister Najib Tun Razak announced today that within 3 (three) working days of the Rakyat voting him to victory at GE 14, he would be refunding the Treasury $2.6 billion. 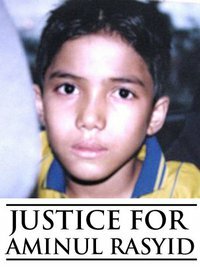 He admitted that this momentous, but wholly voluntary and 'without prejudice' decision, had been arrived at after a 4-eyes meeting with Finance Minister Dato Seri Najib Tun Razak. The breaking news was ecstatically received by UMNO President Dato Seri Haji Mohammad Tun Haji Abdul Razak bin Dato Haji Hussein who confirmed that the $2.6 billion would NOT be deposited into the PM’s personal bank account (akaun peribadi). However, he hastened to add that it also meant that the money could be construed (boleh di ibarat) as being for the benefit of UMNO after RoS verification (by 2050) of its 3 million membership and its financial standing by Chartered Accountants and Auditors, Detoilette Farker Randall & Co. (by 2051). 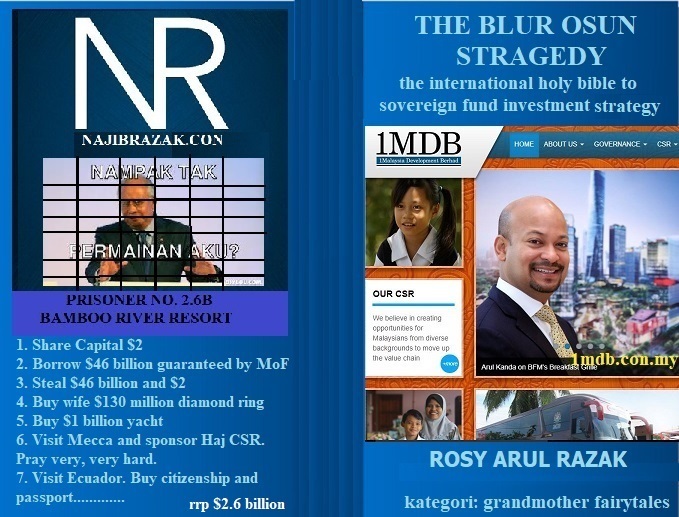 Meanwhile, 1MDB Chairman of Advisory Board and sole authority/signatory for all investments, MO1 aka Najib, maintained that no $2.6 billion cash or $30 billion of investments were missing from 1MDB’s bank accounts or in its financial accounts as confirmed by Chartered Accountants and Auditors, Detoilette Farker Randall & Co. (who withdrew their audit report in 2016). In Kuala Lumpur, MCA President Ajip Kor congratulated PM Najib for resolving the 1MDB/SRC debacle where no $46 billion fraud had been committed. This was echoed by MIC President Appa Najib s/o Bugisamy who hailed Appa’s relentless ‘no stones unturned’ search in tracing the whereabouts of the non-missing and non-fraudulent $2.6 billion donation from unknown Arab Royalty, as truly inspiring. There were also celebrations at the UMNO Pekan Branch which held a tahlil for its Head, Bang Jib, for his generous donation to the Branch’s election funds. In an immediate response too, UMNO said that they had informed the chief of PMO that Kepala Bapa Kau would be nominated as ‘2017 Man of the Year’ and be officially recognised as ‘Bapa Transport Moden’ for the $54 billion (NO OPEN TENDER) Kelang Valley MRT, the $30 billion (NO OPEN TENDER) Pan-Borneo Highway and the $55 billion fraudulent (also NO OPEN TENDER) ECRL, projects. Elsewhere, High Court-declared 'Not Public Official' Najib whose salary is paid from public funds…..